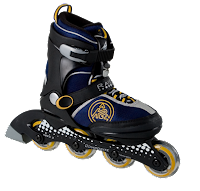 The Raider features unparalleled support, relaxed fit, and first class comfort that make it just right for any Junior skater to have fun. The Raider also comes equipped with ABEC 3 bearings, 70mm wheels, and a push button adjustment through five full sizes. And let's not forget it's affordable.